iconoclasta_88 had the most liked content! I know it's a bit late but -had not logged in a long while-, thanks for your concerns Darren. As Tigui said, it was a mess here around Sept 19 laste year. It was a huge earthquake and many ppl was killed. Close ppl were trapped or lost their homes. Even I got some damage in my appartment. But fortunately it were just minor things. The city pretty much stopped still for a few days and things were very slow and difficult for a few weeks. But a year from it, we are almost ready back as usual. Thx for your thoughts. Saludos. Hey brother! Great to see you over here. Good luck with your approval! Saludos. AWESOME! Great work! Great community! And a question here, for the WTF's raffle, should I contact Walt via facebook or is there a better way to enter? Saludos. Hey Paul! I remember that chat we had a few years ago, when I said doing a Centurion TK was way more work than a TD. You told me all the extra work we put on the TD but know we just ignore cause we are used to it. You were right. And Well.. I would say, ANH TDs are still more difficult to build than most of the Legion characters... they are not easier to build than the SE TD. Less gear, less "specific" details different from a TK. So, its partially out of the box (as out of the box as any TK... and they are not really). But as I said somewhere else, I dont thing there no SE Sandtroopers because of available resources, found parts, kits, or references... there is not one single SE TD cause, well, so far no one has wanted to do one. Not enough anyway. Don't mean we should not have them, and anyone who wants one should be able to do it. But so far... Not much love for it. LOL! So, yes! I hope to see the first SE TD soon!! We need to see it, as a group we owe it to ourselves! 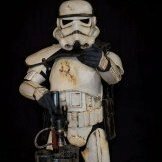 I have been thinking in the back of my mind about building a McQuarry Sandtrooper sometime in the next 5 years. Hope to see a SE TD before that! HEHEHE! Saludos my friend. Woody, you have claimed Lee is Chris brother. I think after Lee's post it's fair to admit they are not siblings. If you could please clarify that in your original post, it would be appreciated. About your request to thoroughly discuss this before removing other statements, I would ask you just to really start taking Lee's post in consideration while we have Chris postings. Lee, I think you have a valid case and posture. But as far as I understand, we do need to read Chris declarations and really start a discussion here to clear all what needs to be clear. I don't want to point fingers at all and won't take sides here. I'm really sorry if you are being signaled unfairly, but to help clarify this even more, could you go ahead and post pictures of your packs? I really don't think you should need to defend yourself to prove you are clear of anything. And I am sorry to ask you this. But hope you can help us here calarify all this as much as possible. To be honest, key declarations here will come from Chris but I don't think you should need them to keep your image clean. Facts shall speak the truth. Facts is what I asked woody and Chris. And, sorry about this but we don't have a choice, text and post by themselves are not enough to be consider facts. Facts we expect come from woody and Chris. But something backing up your facts Lee, would be very useful too. Again, I and the whole CS are trying our best to solve this within the detachment. Please let me know if I can do anything to help. And... also consider that the CS, even if will always keep it friendly and impartial, will act accordingly and make the decision that we might need to take. Whatever they might be. No doubt of it. I need to say too that Chris is aware of this post and issue, we are all expecting him to hopefully post soon and provide info, proof and answers. We will always look for the best interest of this community and its members. Saludos. Juan. GRAN Fotografía hermano!!! Felicidades! Abrazo. Saludos. Got that boss. Hope someone raises their hand soon. Saludos. Awesome shots! Thx Paul!! Saludos. They are screen grabs from a VH1 special about the SE. Don't know when the show actually run on tv. But I found the video o you tube. Apparently and for the date of the files, in 2011. 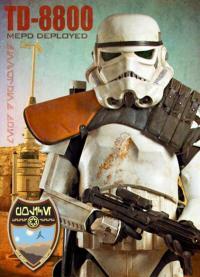 There is only about 1 minute or so on the sandtroopers but enough material to helps us with the CRL Saludos.